Ah yes, the veggie burger. If you’ve ever gone meat-free for a substantial amount of time, chances are you came to rely on this tried and true staple. It’s gotten me through many a company barbecue and airport layover. It turns out though, that most big name veggie burger brands are not actually vegan — most use eggs as binding. Furthermore, let’s take a look at the three leading producers of veggie burgers. Boca Foods, makers of the Boca Burger is a subsidiary of Kraft Foods. Morningstar Farms is owned by Kellogs, as is Gardenburger. While it is possible to find small independently run veggie burger producers (Dr. Praeger’s comes to mind), these three dominate the market. There’s nothing particularly eco-friendly about the packaging. None of the brands I checked use recycled materials, and the patties come individually wrapped in plastic. So what’s an earth-conscious herbivore to do? Make your own, of course! A pinch each of salt, black pepper, and bay leaves, if you have them. Combine all of your wet ingredients, mash slightly with a fork and set aside. In a food processor, grind up all of your dry ingredients until they all resemble breadcrumbs. Mix the dry in with the wet ingredients. Now for the fun part: dig your hands in and mash everything up. Form the mixture into 3 or 4 patties, depending how big you like them. Coat your skillet with cooking oil and put the heat on high. Cook your patties two at a time, for about 3-6 minutes, depending how hot your oil is (and how “well done” you like them). Flip with a spatula and repeat on the other side. Once they’re nice and dark brown, set them aside on a paper towel to cool. Blend until you have a lovely green paste. Add a heaping spoonful to a toasted kaiser roll. Top your burger with lettuce, tomato, and red onion, and you’re good to go. You’ll have plenty of leftover Tomatillo Sauce. Try using it as a topping for burritos, tacos, in a salad, or on another sandwich. These sound good. I like the veggie burgers that are home made from a local restaurant, and their no-meat loaf is fantastic. I will try this recipe. That looks amazing! I’m trying it this weekend. I just had one of these last night, and looking at the picture now I want another one! Thank you for this! Any way I can reduce packaging and feeding corporate conglomerate machines while feeding my face, the better. Yummmmyyyyy!!!!!!!!!!!!!!! My 3 year old scarfed these down and my husband requested that they be inserted in the regular meal rotation. A huge hit, thanks for posting!!!! These came out great, Sharon. Thinking of substituting pine nuts for pumpkin seeds… whaddaya think? I am out of pumpkin seeds. But I have a bunch of hemp seeds. I think I’ll use them in this. 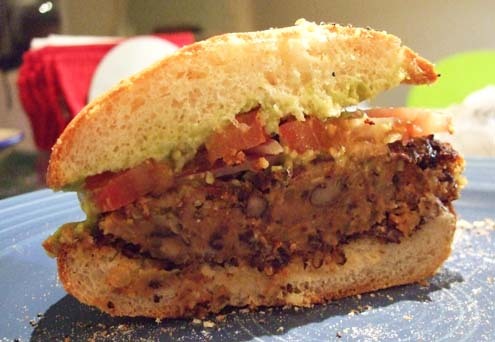 Thank you for submitting this black bean burger recipe. I’m very leery of soy products because I’ve heard too much about how soy products are processed with hexane and other toxic substances – noooo thank you! I stay away from soy and won’t eat “fake” anything made with soy, but I’d like a fake burger and I love beans, so this recipe is EXACTLY what I’ve been looking for. Yum! Thanks! Can’t wait to try it because I LLLLOVE MY BEANS! Super excited to try these tonight, I like the pumpkin seed idea! It’s been so hard to find a good, healthy, hearty black bean burger.. I’ve been on a mission actually- thanks! Going to make these tonight, can’t wait! I’ve been on the hunt for a hearty, healthy BB burger! Love the pumpkin seed idea – thannnkkk you! The corn starch should help bind it. Did the mixture crumble, or was it runny? If it’s the former, adding water by the teaspoon until it’s doughy should help. If it’s runny, a little flour or more breadcrumbs ought to do the trick. Let us know how it goes! This was delicious. At first, I was disappointed because the middle didn’t seem cooked, but it was great. Just the right amout of cayenne and paprika! Thanks so much-we have been eating your black and white bean burgers for years! Is there an easy way to print these recipes? Pingback:Black Bean Tacos for Cinco de Mayo! : Eat. Drink. Better. Pingback:Meatless Mondays: Easy Veggie Burger with Carrots, Zucchini, Chickpeas and Halloumi Cheese : Eat. Drink. Better. Pingback:What’s in Your Happy Meal? : Eat. Drink. Better.